Euro 2016, Final, Stade de France, 10/7/16. So. It wasn’t to be Germanic hegemony after all. Neither was it to be French triumph. Like a lot of the knockout matches this was a spectacularly dull game but it suggested one thing to me. Portugal are a better team without Cristiano Ronaldo in it than with him. I felt much the same about Liverpool in the latter stages of Steven Gerrard’s time with them. It seemed to me the rest of the Liverpool players were looking too much to Gerrard, giving way to him or allowing him to have the ball when they were in better positions to do something with it. So too with Ronaldo and Portugal. Throughout the tournament (though perhaps not the 3-3 draw with Hungary which I missed as I was watching the Iceland-Austria game) there was something about the way they played with him on the pitch that rendered them less effective as an attacking force. His hogging of all the free kicks with no fruitful result whatsoever was almost laughable. Okay, he did score that header against Wales and scuffed the assist for Nani’s toe-poke in that game but otherwise there was little end product and he seemed to get in the way at times. With him not available others stepped up to the plate – particularly Eder who I doubt would have made it onto the pitch if Ronaldo hadn’t been injured. Euro 2016, Round of 16, Stade de Nice, 27/6/16. It’s hard not to think that there’s some sort of karma about this result. After England voting to leave the EU (loosely referred to as Europe) its football team has just departed Europe unwillingly. The commentator on ITV called it a humiliation and also used the word embarrassment. The unspoken assumption (though it was all but articulated) was that England should always be beating Iceland. Well; to anyone who had watched Iceland’s group games this was no surprise. Iceland are supremely well organised, the players know what they’re supposed to be doing and play for the team and each other. They drew with Portugal and group winners Hungary and then beat Austria, well fancied before the tournament began. If that wasn’t sufficient warning as to what to expect what would be? Using words such as embarrassment and humiliation is extremely disrespectful to a group of players who work their socks off and have no little ability. I expect France will also find it hard to break them down in the next round. Iceland know their limitations and strengths, and play to them; as a team. The same was true of Italy earlier in what was a magnificent team performance against Spain. England’s most penetrative player tonight was an 18 year old who was only brought on to the pitch when it was far too late and has in any case not yet had the enthusiasm and any latent talent knocked out of him by unwarranted expectation. The doorway has strong deco styling. Inscribed above it is Harwood House and round it is, “By Farmers for Farmers” but I think it’s a solicitor’s now. Higher still the detail shows a cow’s head and a stylised human one. 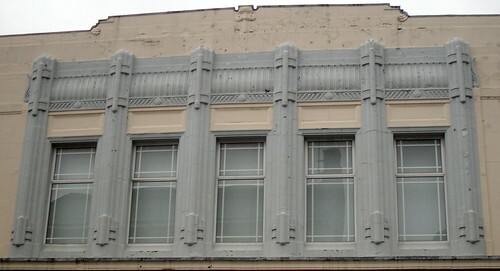 There was another shop with deco styling, Townrow. The window styling here argues for deco, and the horizontal and vertical stepping, but this part may be pre-deco. The extension on the right hand side has had its windows mucked up. 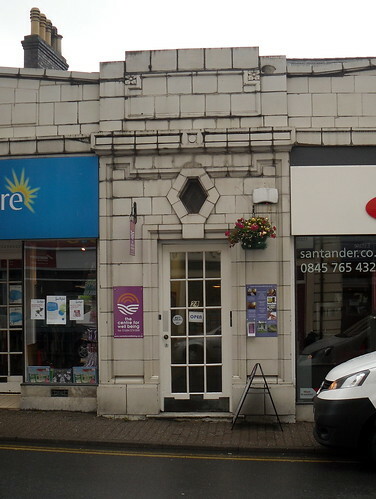 The brickwork on yet another shop also argues for deco. 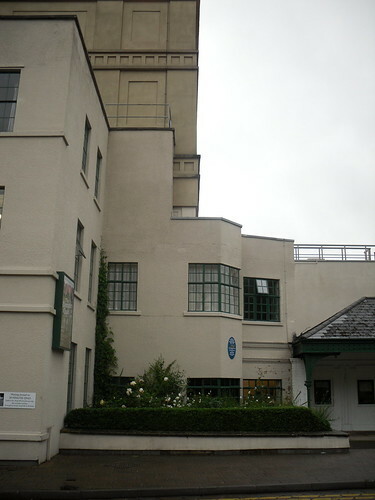 If the original windows had been retained that might have clinched it. 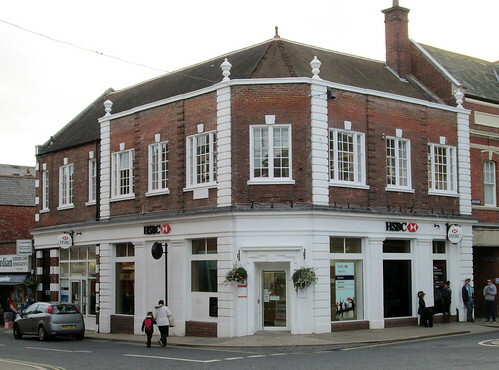 I make that twelve Deco buildings for Melton Mowbray – all packed into a small area. 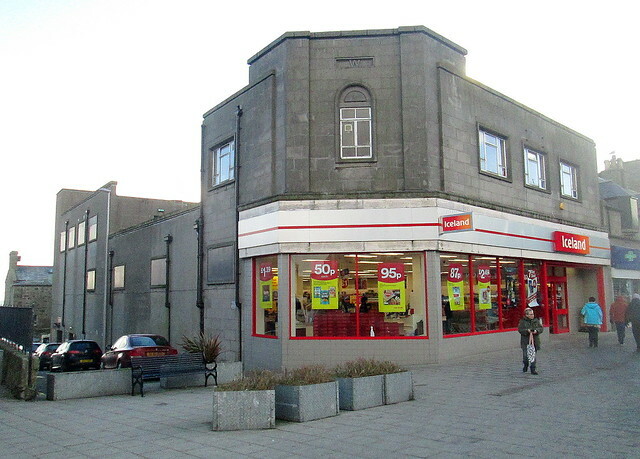 We stopped off at Morpeth in Northumberland on our way down south and found a plethora of Art Deco buildings. 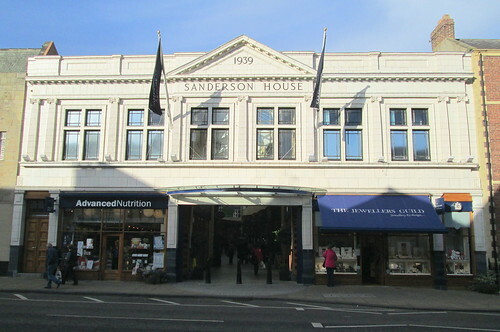 The most striking was Sanderson House on Bridge Street. The semi-circular canopy looks very recent. 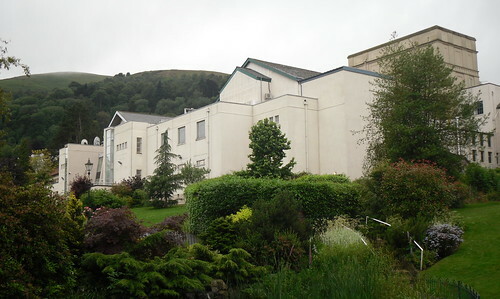 The entrance leads through an arcade to shops out the back. There’s a good attempt here to retain the style of the windows. 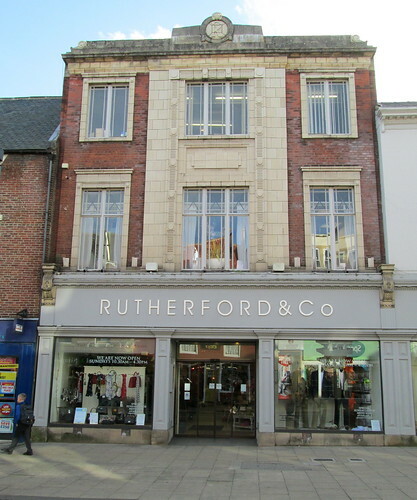 Rutherford & Co is also on Bridge Street. Could it once have been a Burton’s? 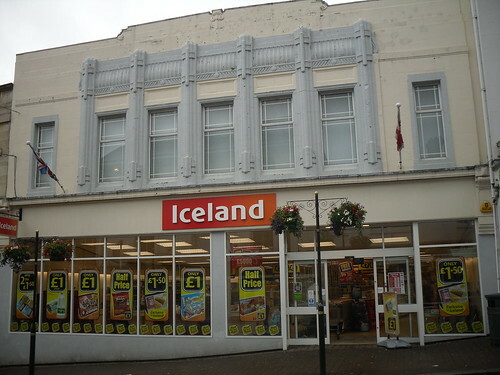 My immediate thought on seeing the Iceland shop was “Woolworths.” Checking Google Maps when I got home I found it was indeed before that company’s demise. 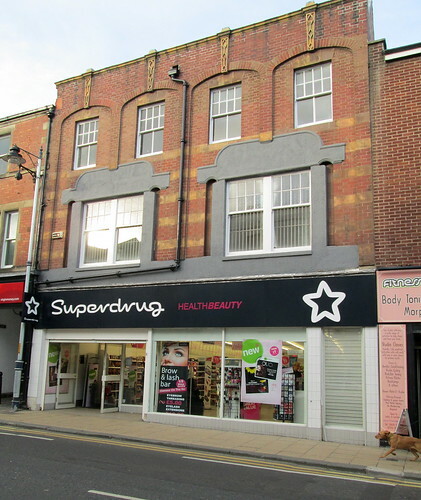 The building occupied by Superdrug also has Deco features. The grey area round the windows is interesting, as is the detailing high up. The middle windows retain an old style quality. 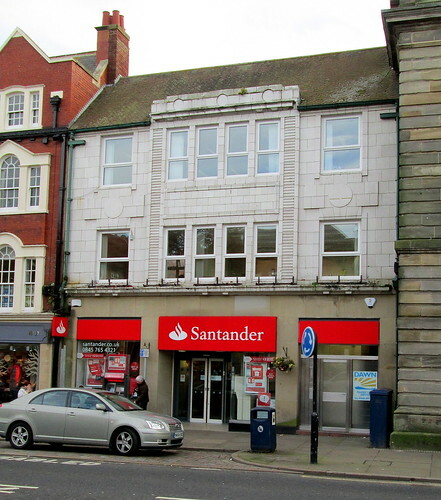 Santander bank premises. The windows here have been mucked about with but the embellishments above them are good and I like the roundels in the stonework. This last one – HSBC – is on the cusp. It’s got verticals and horizontals and good detailing around the door but the finials on the pillars aren’t really deco. 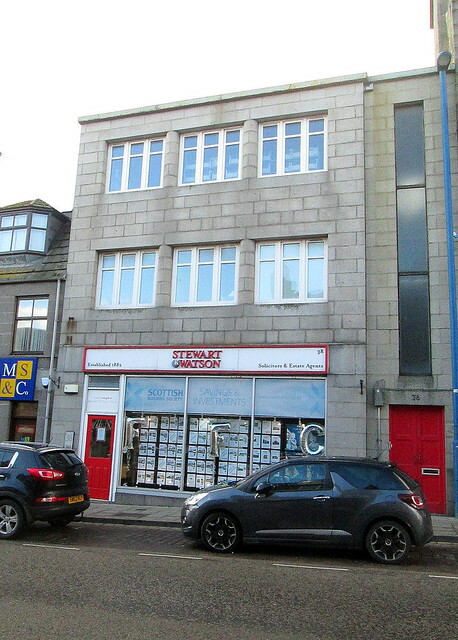 I make that six Art Deco facades – all on the one street! Morpeth obviously had a lot going for it in the 1930s. It’s still reasonably prosperous looking. The day we visited Great Malvern…..
Well, we didn’t really see the Malvern Hills: only the mist/clouds rolling all over them. 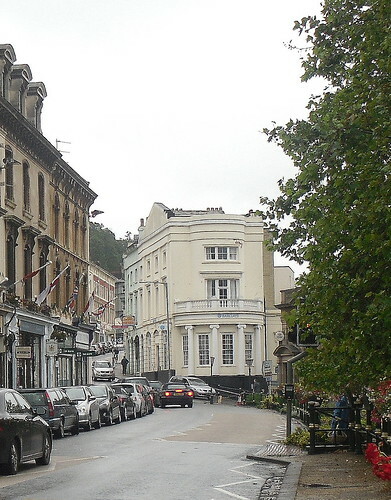 We hadn’t realised the town would be about 1/4 of the way up them and the town itself is strange. We came in from the Worcester end where first there’s a lower bit on the level with a few shops we didn’t stop at and then you go higher and eventually reach the main centre. We followed the signs to a car park and discovered it was a fairly steep climb to the shops. It looked to me as if it might be deco. After some more climbing (past a mediæval Priory) we came on a second hand book shop where the good lady made a couple of purchases, then up once more to the main street. 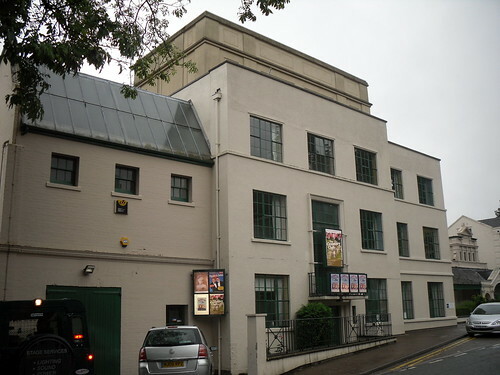 The building straight ahead has aspects of deco but probably isn’t. 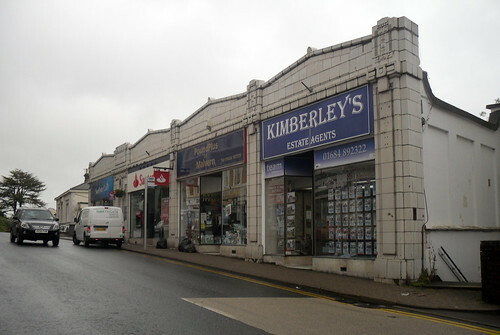 Right along the street which curves to the left in the above was this row of shops. There is some fine detailing round and above a doorway about 3/4 of the way along them. Coming back along we dropped into an Amnesty International charity shop and I bought two books. (The good lady’s haul was considerably larger.) 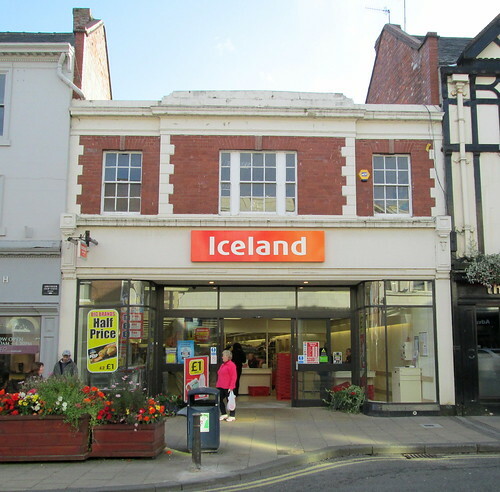 Going down towards the car park I took two photos of the building which now houses Iceland’s outlet in Great Malvern. 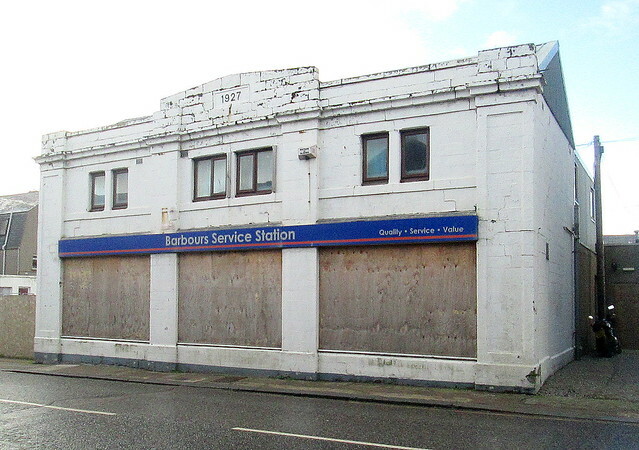 From the way it looks I think it may once have been a Burton’s. I couldn’t really get it in one shot. Here’s the detail.